In a closely fought encounter between two young sides, it was Aizawl who continued their fairytale run with Ralte snatching three points for the away side. The home team certainly created more chances throughout the game but a tired squad failed to capitalize on their chances as they succumbed to another defeat at the hands of Aizawl. DSK are yet to win or for that matter, even score against Aizawl in their four games. The home team came into the game with four changes to the side that earned a last gasp point in Chennai on Sunday. 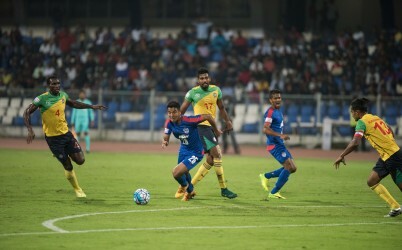 Sasha Kolunija made his return to the side for the first time in a month, while Jerry Lalrinzuala, Milan Singh and Holicharan Narzary also made their back into the side. Aizawl on the other hand named an unchanged starting XI from the team that beat Mumbai FC 2-0 over the weekend. It was DSK who created the bulk of the chances in the first half, although golden chances came at a premium for both sides throughout the encounter. Holicharan Narzary got on the right end of a cross but Albino Gomes palmed the ball away in the 10th minute. One of the biggest talking points of the first half came moments after a long distance attempt from Narzary went out for a corner. 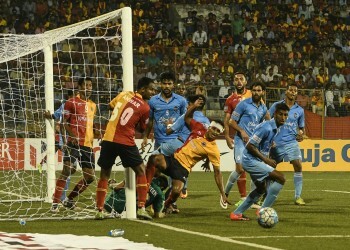 A scuffle broke out between the two sets of players before the resulting corner, where Ashutosh Mehta and Sasha Kolunija needed to be calmed down by the referee. The best chance of the half by far fell to DSK Shivajians youngster Paite. 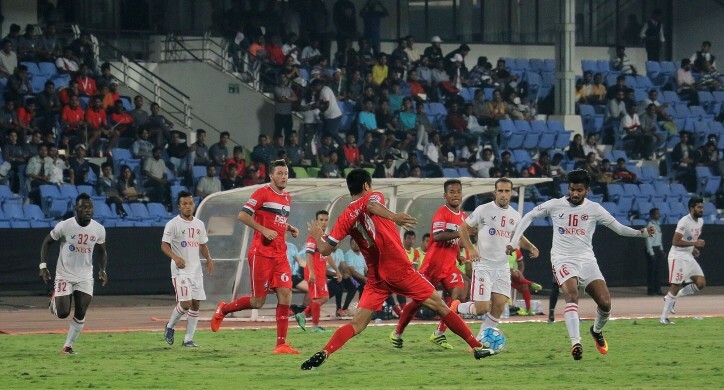 A cross from Chettri had seen Juan Quero take control of possession and put the ball on a plate for the No. 21 who failed to connect with the ball and scuffed his chance. Aizawl held on till half time to reach the break at 0-0, reducing DSK’s attacks to a couple of shots from outside the box. The visitors themselves had created their best chances in the 38th minute when Laldammawia Ralte’s shot from the edge of the box was skied. Sasha Kolunija proved to be a scorn in the Aizawl side’s charge as he denied them golden opportunities on two occasions at the start of the second half. First, he stopped Jayesh Rane from receiving a free header with a crucial intervention before producing a wonderful block on Ralte who had a free chance at testing the goalkeeper. As the hour mark approached, both sides made changes to their side as Chhangte and Pradhan joined the action for the home side while Lalmuankima came on in place of Brandon for the Reds. Finally, in the 85th minute when it seemed like both sides would have to be content with a draw, Kima pulled a wonderful low cross for Laldanmawia Ralte to slide into the DSK goal. The late strike was met with euphoria from the away supporters who travelled in great numbers. DSK almost equalised the next moment, though, as Chhangte ended up being an inch away from poking home a low ball across the face of goal. In the end, despite DSK’s late charge, which included a fine shot from Quero and a chaotic last minute corner, it was Aizawl to got the win, and all three points. The win has taken the team from Mizoram to the top of the table in what has been a fairy tale season, meanwhile DSK will be left to rue their luck.